As Dad, you have rights. While they often come with obligations, and while parenthood isn’t always baseball games and fishing trips, we can help you assert those rights. Parental relocation may be the single most emotional aspect of domestic litigation. Whatever side you find yourself on, we can help. There is no way to guarantee that we make everyone happy. People have different needs and different expectations, and come into their own cases in the Family Court from different spots in different lives. And, as you know, testimonials on the Web contain only the high points. Thankfully, we have plenty of those. Unlike some other attorneys who dabble in several different practice areas, some of which are entirely unrelated to your case, Family Law is the sole focus at Lowcountry Divorce & Family Law. Such a narrow focus means that the issues relevant to your case—and to your family—are never far from mind. 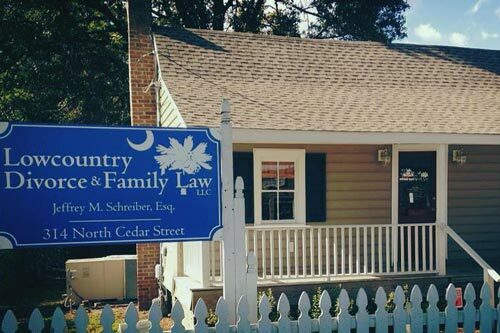 Nestled under the shade of Pecan and Live Oak trees on North Cedar Street in beautiful and historic Summerville, South Carolina, Lowcountry Divorce & Family Law is easily accessible from all areas of the the Lowcountry, with convenient and free parking located right outside the front door. Perhaps you are looking for a way out of your marriage. Perhaps you have been cheated on. Perhaps you have been abused. Perhaps you and your spouse no longer see life in general in the same way and have ostensibly become roommates. The end of a marriage should be approached with every bit of the same careful examination and consideration as the beginning of a marriage – more so, actually. Perhaps you have a child, or a few of them, and co-parenting is not quite coming as easily as originally hoped. Perhaps someone has changed. Perhaps someone has begun dating other people and has prioritized that person ahead of your child. Perhaps someone has decided it was okay to place your children in the middle. Perhaps someone isn’t behaving properly, and for once it’s not your child but his or her mother or father. Family Law in general is intensely personal. Just as every client is unique, every family situation is unique, and each and every person who walks up to our front porch does so for reasons as individual and distinctive as their own fingerprint. At Lowcountry Divorce & Family Law, dealing in the Family Court is all that we do. And, if we cannot help you or it is simply just not a good fit, then we will happily help point you in the right direction. You deserve a family law attorney who not only knows the law but also knows your story as well as you do, a lawyer who can represent you with the same passion that you would have if you represented yourself. Lowcountry Divorce & Family Law is devoted entirely to family law, including divorce, separation, child custody, child support, and more.